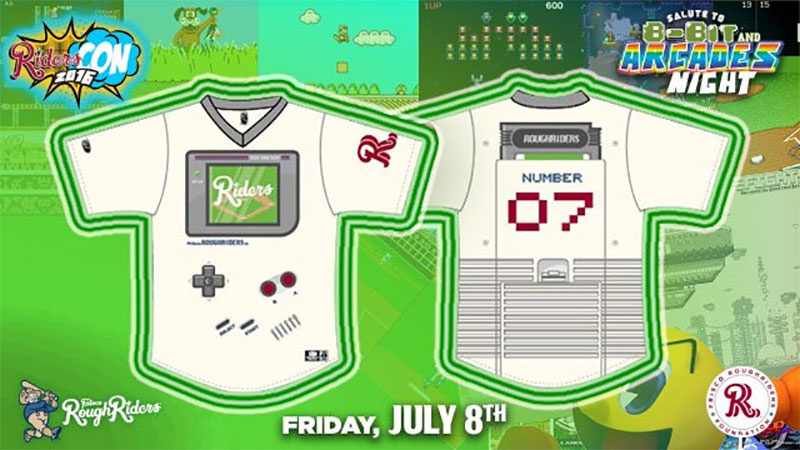 Minor league baseball team Frisco Roughriders has something of a habit of getting its players to wear unique shirts based on pop culture icons, and this year the team is harnessing the power of Gunpei Yokoi's finest creation, the Nintendo Game Boy. The Roughriders - who play at the amusingly-named Dr Pepper Ballpark - are holding their annual Riders-Con soon, which is best described as a series of game dates based around celebrity appearances and tributes to "some of the most beloved enterprises in television, movies, sports, and pop culture". The uniforms feature the text "Riders" inside of the Game Boy "screen" on the front of the uniform top, above of a directional pad, "A," "B," "Select," and "Start" buttons along with the classic Game Boy vent-style speaker on the lower right-hand side. On the back of the uniform, each player's number will be represented with 8-bit digits and their name written on the top of an inserted "game cartridge." The team will feature retro arcade games inside the ballpark and will be giving away both a next-gen and a retro gaming console that night. The fun continues as the Riders will be recreating classic video games as in-between innings contests. It actually sounds like a lot of fun, and if you're like us and based in the UK, it makes our sporting events seem a bit dull in comparison. Are you a Roughriders fan? Will you be attending any of these nights? What do you think Nintendo thinks about its IP being used in this way? Let us know your thoughts by posting a comment below. this will be the best selling minor league jersey since michael jordan's. clever work there. hopefully no c&d from nintendo forthcoming. tell them nlife sent you. there won't likely be a discount. it'll just be so they won't wonder why they're getting so many orders outside of san francisco. At least they didn't opt for the clear version of the original gameboy. @shaneoh i shall avoid the sexist comment of 'maybe for the cheerleaders' because it's international women's month. Why is it “amusing” that Dr. Pepper bought naming rights to a stadium? They look awesome. Hopefully they win when they wear them. inb4 legal action from Nintendo. yeah, nintendo wont even let people play their games on youtube. this is not gonna fly..
You gotta' love minor league sports. I would go to that game if my local minor league team did a theme night like that. My local team does a Hunger Games theme, a super hero theme, and they do a theme night where these monkey's wearing cowboy costumes ride around on border collies in the outfield! @Jamotello Those aren't smelly. I want one of those that will be auctioned. Wow, I live right by the Rough Riders. Funny to see my favorite British site writing about Frisco. If you redcoats love shenanigans like this with your sports, you all need to be more invested in minor league baseball. Minor league teams often struggle with attendance, so they do all kinds of wacky promotions to generate interest. See the @dkxcalibur post upthread. always been a huge baseball fan, sounds like fun! Too bad its on the opposite side of the country from me, haha! Come on author. Look up where the team is from and put it in there - It's Texas by the way. The stadium is called Dr. Pepper stadium because that's who sponsors it. It's not amusing if you live in the U.S. and all the stadiums are sponsored by osmething and no longer have a cool name or just the name of the owner. It's a cool idea, my local team is doing some fun things, but would like to have seen this. @MadAdam81 That would be perfect. They should have alternate uniforms for every Nintendo console. The ballpark is local, right outside of Dallas, TX. Guess I am going to have to go to that game.